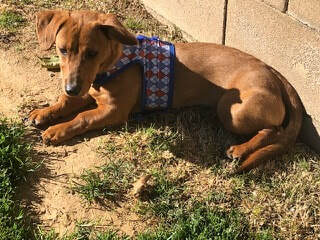 Jersey is a 1 year old female Doxie who ended up in a local LA county shelter. She was in a cage with many other dogs so I knew she got along with dogs, but she stayed to the back of the cage as if she was shy. It turned out she was scared and insecure because since she’s been in a foster home, she has proven to be very outgoing, and very affectionate. Jersey is a big standard girl but she is still a puppy and behaves like a puppy. She has a lot of energy, loves to run around the yard, not surprising since she was cooped up in a cage for a long time. She is learning to walk better on a leash than when I first got her but could still use some leash training. She uses the doggie door but cannot swear she’s 100% housebroken. She does potty when I go out with her. I think she can be easily trained to do pretty much anything. She can jump up on furniture, beds, anywhere she thinks she wants to be. She sleeps well in a crate at night. I’m sure she’d love to sleep in the big bed but there is no room at the inn. She woke me up at 1:30am and 2:30 am the first couple of nights to go out to go potty. But after a few nights, I decided to ignore her and now she sleeps through the night. She was really good getting her bath and seemed to enjoy the warm water and the massage. Her coat is super soft. Jersey would make a great family dog. Because she’s a puppy, she would not be good right now in a home where she’d be left alone for hours at a time by herself. She hasn’t chewed anything but she has moved a few things. Jersey is really a good girl and deserves a home with lots of love, exercise and attention. Jersey is spayed, up to date on shots and micro chipped. For more information on Jersey, feel free to e-mail me at doxykeeper@me.com or call 661 943-4888. 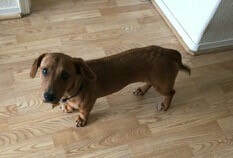 An approved application is required for Jersey’s adoption. The tax deductible adoption donation for Jersey is $225.